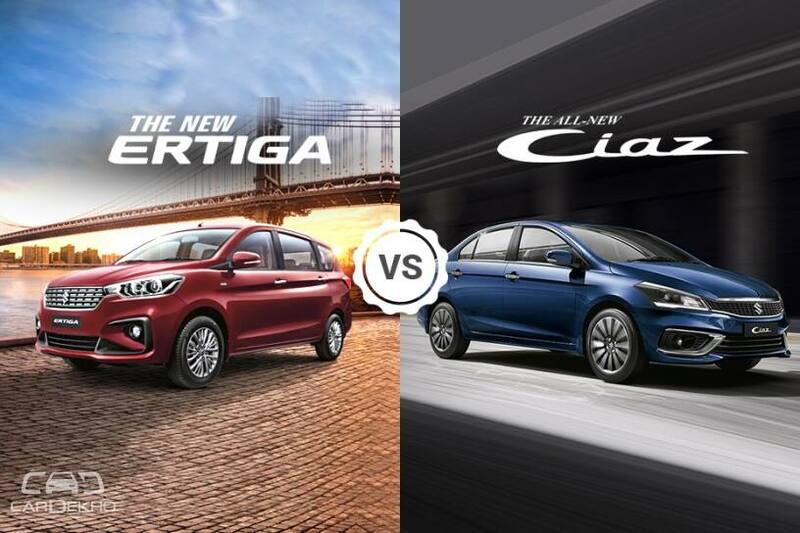 HomeNew CarsNewsClash Of Segments: Maruti Ertiga Vs Maruti Ciaz- Which Car To Buy? Maruti recently launched the much-awaited second-gen Ertiga in India where it goes up against other 7-seater MPVs like the Mahindra Marazzo and the Honda BR-V. But, in terms of pricing, it also competes with its stablemates, the Ciaz, Vitara Brezza and the S-Cross. For starters, let’s pit it against the Ciaz on paper, to find out which Maruti car suits your requirements better. An MPV: The Ertiga is a 7-seater MPV. However, the third row of seats is recommended for kids only due to the limited space. A sedan: The Ciaz is a traditional three-box sedan which can seat upto five and hold a good amount of luggage as well. Higher Seating: Thanks to its tall boy design, it offers a good amount of headroom, which makes it better suited for taller drivers. Lower Seating: The Ciaz, on the other hand, offers limited headroom. So, it could be a problem for taller drivers. Safety: Dual front airbags, ABS with EBD, ISOFIX child seat anchors, rear parking sensors and high speed alert system. Lights: Halogen projector headlamps and turn indicators on ORVMs. Wheel: 15-inch steel wheels with wheel covers. Infotainment: Basic music system with Bluetooth and steering-mounted controls. Other features: Electrically adjustable ORVMs, central locking, adjustable front headrest, manual AC with rear AC vents, tilt-adjustable steering, manual day/night IRVM and rear centre armrest. What Ertiga Vxi offers over Ciaz Sigma: Ventilated front cup holders, electrically foldable ORVMs and adjustable rear headrest. What Ciaz Sigma offers over the Ertiga Vxi: Front centre armrest. Verdict: The Ertiga Vxi would be our pick here. It is not only more affordable than the Ciaz, but is better equipped and can seat more too. It does miss out on front centre armrest, but that is not a major miss in our books. Other features: Front fog lamps, height-adjustable driver seat, front armrest and auto climate control. What Ertiga Zxi offers over Ciaz Delta: Electrically foldable ORVMs, ventilated front cup holders, adjustable rear headrest and push-button start. What Ciaz Delta offers over Ertiga Zxi: Cruise control. Verdict: If you don’t really need a 7-seater MPV, we suggest you go for the Ciaz. The Ertiga does get some extra features, but the premium it attracts for those is steep in our opinion. The Ciaz makes even more sense if the majority of your commute consists of highway driving as the sedan comes with cruise control, which is not available on the Ertiga. Common Features (over previous variants): Push-button start, electrically foldable ORVMs, adjustable rear headrest and a reverse parking camera. What Ertiga Zxi+ offers over Ciaz Zeta: 7.0-inch touchscreen infotainment system with Apple CarPlay and Android Auto and ventilated front cup holders. What Ciaz Zeta Offers Over Ertiga Zxi+: LED headlamps with LED DRLs, LED fog lamps, and auto-dimming IRVM. Verdict: Both the cars are quite fairly equipped here. While the Ertiga comes with more feel-good features, the Ciaz gets more utilitarian ones. So, our pick here would be the Ciaz. Also, the LED headlamps on the Ciaz and the auto-dimming IRVM on the Ciaz will come in handy while driving at night. Safety: Dual front airbags, ABS with EBD, ISOFIX child seat anchors and a high-speed alert system. Other features: Manual AC, all four power windows, tilt-adjustable steering and central locking. What Ertiga Ldi offers over Ciaz Sigma: Ventilated front cup holders and adjustable headrests for rear occupants. What Ciaz Sigma offers over the Ertiga Ldi: Body coloured electrically adjustable ORVMs with turn indicators, wheel covers, rear AC vents, day/night IRVM, front and rear centre armrest and a basic music system with Bluetooth and steering-mounted controls. Verdict: The Ciaz is the better-equipped car here, however, the premium it attracts for those additional features is too steep in our opinion. So, we will recommend you to go for the base-spec Ertiga and get the required features like a music system, day/night IRVM, wheel covers fitted from the aftermarket which will cost approximately Rs 10,000. Infotainment system: Basic music system with Bluetooth and steering-mounted controls. Other features: Body coloured electrically adjustable ORVMs with turn indicators, day/night IRVM, rear centre armrest and rear AC vents. What Ertiga Vdi offers over Ciaz Delta: Ventilated front cup holders, adjustable headrests for rear occupants and electrically foldable ORVMs. What Ciaz Delta offers over Ertiga Vdi: Alloy wheels, front fog lamps, auto climate control, front armrest, height adjustable driver seat and cruise control. Verdict: If you don’t really need a 7-seater MPV, you should go for the Ciaz. It sure is more expensive than the Ertiga, but the price premium is justified given the additional features it gets. Common Features (over the previous variants): Alloy wheels, front fog lamps, electrically foldable ORVMs, front armrest, height adjustable driver seat, adjustable headrest for rear occupants, auto climate control and push button. What Ertiga Zdi offers over Ciaz Zeta: Ventilated front cup holders. What Ciaz Zeta offers over the Ertiga Zdi: LED headlamps with LED DRLs, auto dimming IRVM, LED fog lamps and reverse parking camera. Verdict: If you don’t really need a 7-seater MPV, the Ciaz is the one to go for. It certainly is more expensive than the Ertiga, but the price premium is justified given the additional features it gets. Infotainment system: 7.0-inch touchscreen infotainment system with Apple CarPlay and Android Auto. What Ciaz Alpha offers over the Ertiga ZDI+ : LED headlamps with LED DRLs, auto dimming IRVM and LED fog lamps. Verdict: Both the cars are quite evenly equipped in terms of features. However, if you don’t need the convenience of seven seats, the Ciaz would make more sense for you. For a premium of just Rs 7,000, you get LED headlamps with DRLs, LED fog lamps and auto dimming IRVM, making it a great buy in our opinion. More versatile: The Ertiga comes with foldable second and third row of seats. So, while it can seat upto seven people, when not in use, the seats can be folded to open up 803 litres of boot space. More comfort: The Ertiga gets adjustable headrest for all three rows and reclinable second and third rows as standard. So, for a fleet operator who’ll have occupants in the second and third rows more often or the chauffeur driven, the Ertiga is the right choice. More frugal: Despite being powered by the same set of petrol and diesel engines with similar transmission units, the Ciaz is more efficient of the two. Better equipped: The Ciaz has a slight edge over the Ertiga in terms of equipment. It comes with LED headlamps with DRLs, LED fog lamps and auto dimming IRVM, which not only adds to the looks of the car, but to the utility as well.